Designed to offer superior hand protection due to their level 4 cut resistant HPPE and glass fibre liner, the Portwest Sabre Cut-Resistant PVC Dot Palm Gloves A640 manage to ensure exceptional grip during general handling activities. 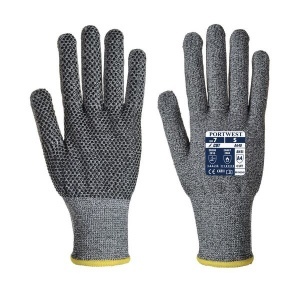 Their PVC dot palm coating improves grip performance in all conditions, making the gloves ideal for industries such as glass handling, engineering and manufacture. 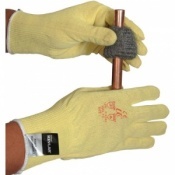 The Portwest Sabre Cut-Resistant Gloves should be the first port of call for any manual handling activity. 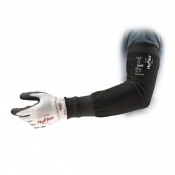 This is because they manage to provide exceptional hand protection with their level 5 cut resistant properties, while their specially fitted PVC dot palm coat provides grip, ensuring that the user can work securely and safely. 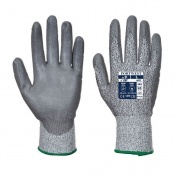 The Portwest Sabre Gloves are available in four sizes that should be suitable for most users. To find your perfect pair, please measure the circumference and length of your palm and match the results to the table below.